As every correction will find its end sooner or later this setup will arise from our market view making the green price area around 77/78 a brilliant long term long setup. Position yourself accordingly. As we follow our big Pic analysis of the Dax (linked below in our recent analysises) a (IV) wave is needing to somehow find deeper prices. This count in 15min Chart is trying to grab that expected downer as the assumed c of A of (IV). 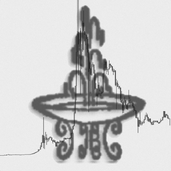 LTC-USD - For whom the short bell tolls...again! Harmonic wave interpretation allowing this pattern to seek even lower prices than reached in the December lows for Dash in a C wave Down.